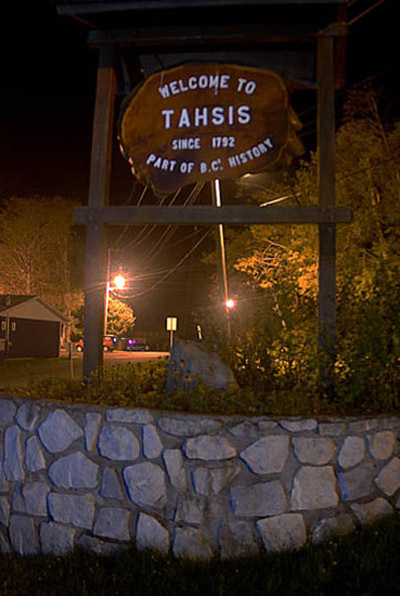 Photo: The tiny village of Tahsis played an enormously important role in the early history of British Columbia, a fact in which its citizens take great pride. Photo by Curt Bowen. Photo: Passengers on the Tsawwassen/Nanaimo ferry run know that they are nearing Nanaimo when the ferry glides past this picturesque lighthouse scene. Photo by Curt Bowen. 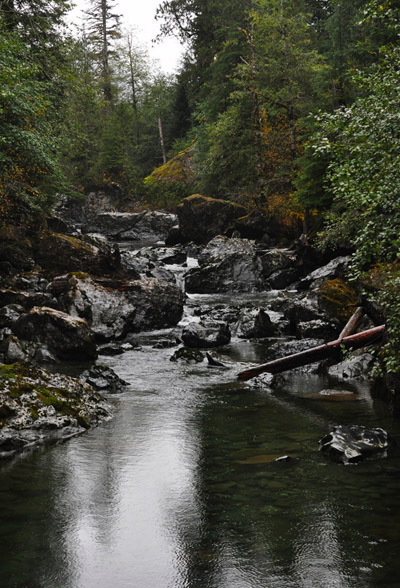 Photo: One of many beautiful small streams passed by travelers on their way to and from Tahsis. Photo by Curt Bowen. I had collected Curt Bowen from SeaTac International Airport the previous night after he had arrived from Florida, and the springs of our vehicle were heavily weighted down with photo and dive gear. Crossing the border in the dark at Blaine, the ADM team caught the 7:45 AM ferry at Tsawwassen and spent the majority of the two hour crossing to Vancouver Island on the upper deck with our cameras and zoom lenses, each of us seeking the photo opportunities that always seem to magically appear for passengers on the BC Ferry system. Our team consisted of ADM Publisher Curt Bowen, ADM Photojournalist John Rawlings, and three noted Pacific Northwest underwater photographers  Valerie Lyttle, Bob Bailey, and Bruce Yates. Each of us was excited to reach our destination and piling up some new images in our portfolios. Landing at the picturesque port city of Nanaimo on the southeast coast of Vancouver Island, we turned our vehicles northward and proceeded up-island toward our destination  the tiny and isolated village of Tahsis on the west coast of the island and at the inland tip of Nootka Sound. 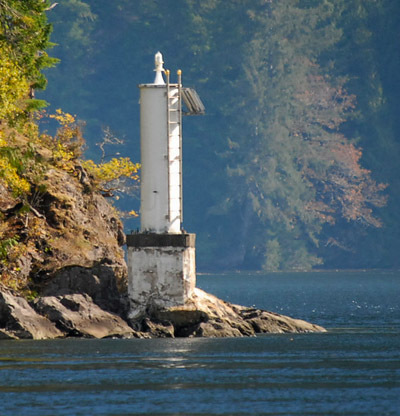 Photo: The light beacon marking Mozino Point - the "signature" dive site of Tahtsa Dive Charters and one of the most beautiful cold-water dive sites on Earth. Photo by Curt Bowen. 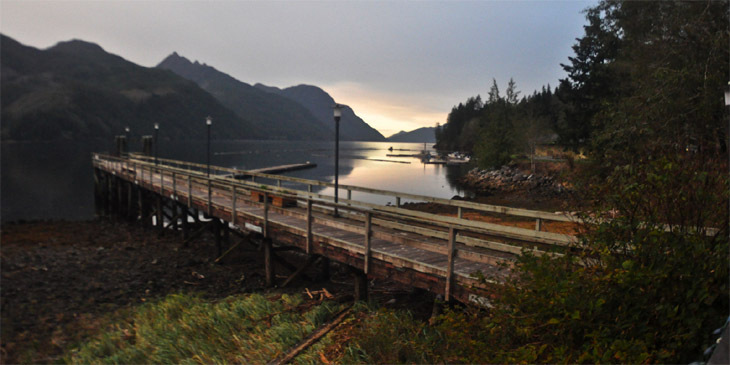 Nootka Sound is known historically as the Birthplace of British Columbia, as it was here where Captain James Cook first landed during his third incredible voyage of discovery in March of 1778. Warmly greeted by Maquinna, the chief of the Mowachaht First Nations peoples, Cooks glowing reports of the friendly welcome and abundant natural resources launched massive trading efforts designed to feed the lust for sleek furs in both Europe and Asia, and the modern history of what is now known as Vancouver Island and British Columbia began. To this day, the location of the village where Cook landed is known as Friendly Cove. Over two centuries have passed since that first exciting meeting between Cook and Maquinna. 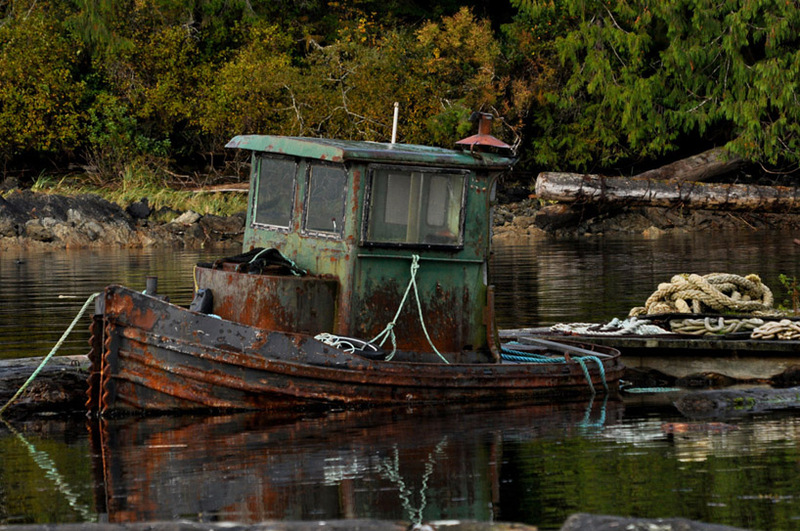 I was originally attracted to the area because of this history, but from day one of my very first visit to Nootka Sound years ago it has also been firmly established in my mind as one of my favorite locations on Earth for diving. Photo: Part of the harbor at Tahsis - a scene at low tide. Photo by Curt Bowen. When Captain Cook and the other early traders and explorers arrived, they were absolutely astonished at the raw beauty of the endless forests and the bountiful resources, but as they walked upon their wooden decks staring out at natures bounty, they little suspected the absolutely incredible beauty that existed beneath the waves. Such discoveries awaited the advent of modern diving equipment and photography. An additional and special attraction for me has also been friendship. From the moment that we first met, Scott and Jude Schooner of Tahtsa Dive Charters have built a warm place in my heart based on their kindness, honesty and decency  a dive trip with them is like a trip with beloved family  something that I have come to cherish. 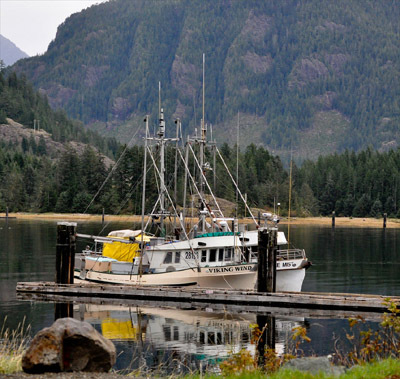 Located at the foot of the government dock in the village of Tahsis, Tahtsa Dive Charters supports divers and sea-kayakers year-round and they know the best locations within the Sound for adventure and photography, both below and afloat. 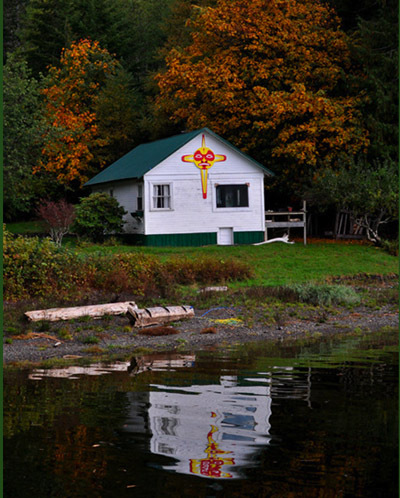 Tahtsa is a Cheslatta Ten (First Nations) word meaning Waters Far Off, a name extremely applicable to the location! 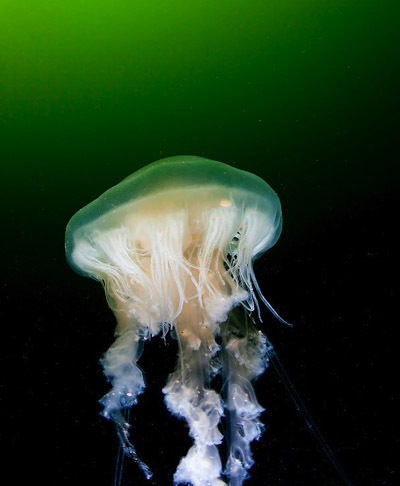 Photo: In stark contrast to the emerald green background of the North Pacific, a "Fried Egg" Jellyfish, Phacellophora camtschatica, pulses its way through the water. Photo by Bruce Yates. Our team arrived at Tahsis in the late afternoon, just in time to see the majestic rays of the sunset dance along the slopes of the mountain peaks surrounding the harbor  a superb welcome! After unpacking our gear we made our way to the local Pub, (an absolute shocker, I know! ), where we were greeted with warm smiles and the comment  you folks must be the divers! During the peak summer fishing season, Tahsis grows to approximately 1,500 souls, but in the off-season, it shrinks back down to 300 residents and absolutely everyone knows everyone else. Newcomers to the village, such as our team, are immediately noticed and welcomed, and each of us felt the friendliness of the community throughout the entire week. 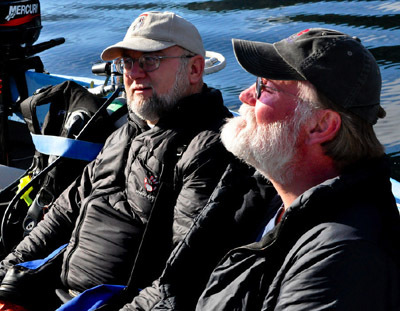 Photo: ADM Team members Bob Bailey (L) and John Rawlings (R) soaking up the sun's rays during a surface interval. The team was blessed with perfect weather throughout the week. Photo by Bruce Yates. Photo: ADM Photojournalist John Rawlings prepares to enter the water with his Classic KISS Rebreather. Photo by Bruce Yates. 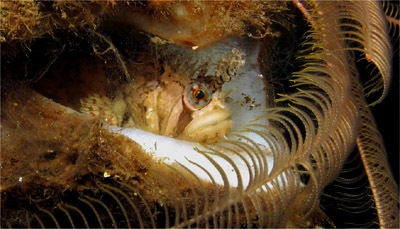 Photo: A tiny Decorated Warbonnet, Chirolophis decoratus, peeks out at the world from within a Round-Lipped Boot Sponge. Photo by Bob Bailey. 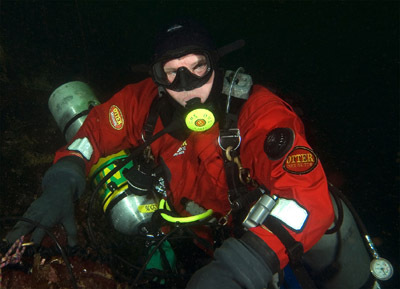 Photo: ADM Publisher Curt Bowen prepares for his dive with his Armadillo sidemount harness. An incredibly versatile piece of equipment, the Armadillo enables a traveling diver to dive virtually anywhere that tanks are available. Photo by Bruce Yates. Photo: A beautiful example of a Red-Trumpet Calcareous Tubeworm. Named for its trumpet-shaped operculum, the colors displayed by this species can be absolutely astonishing. Photo by John Rawlings. The week prior to our arrival had seen some pretty intense rainfall accompanied by some flooding of the rivers and streams. A couple of the roads had been literally washed out in places. As a result, we had some worries regarding underwater visibility due to run-off. Another concern was that we wanted the first dive to be a shakedown to make certain that all of our equipment had managed to survive the journey and that there would be no major gear surprises during the week. Sizing up our needs, the following morning Scott took us to a site known as Boulder Alley, a location named for massive clusters of large boulders  some as large as houses  that had fallen into the water from an adjacent cliffside eons ago. As you approach this site from the water you can see massive holes in the cliffside where the boulders once were, giving you a fairly good idea of the structure you will encounter during the dive. The boulders extend from just below the surface down past 150 FSW and attract large schools of fish, larger predators such as Lingcod, and frequently adult Puget Sound King Crabs. 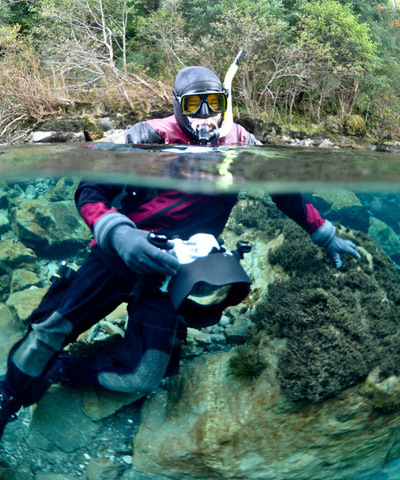 In addition to providing photo opportunities, divers can also easily use the huge boulders to escape troublesome currents. 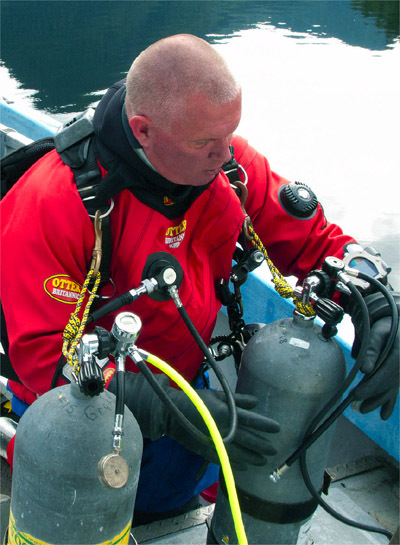 Curt was diving with his Armadillo sidemount system and two steel 119 tanks, while I was diving with my Classic KISS CCR  it was obvious that we would have the most bottom time on the dive, so it was decided that we would enter the water first. I was vastly entertained by watching Curt waddle toward the side with those two 119s  it was like watching the hunchback, Quasimodo, prancing around in Paris with a pair of cathedral bells! With an absolutely enormous splash Curt hit the water and Scott handed down his camera. I followed a couple of minutes later and, after collecting my camera, together we began to sink downward into the emerald green murk. That murk only lasted briefly, though  it was a fresh-water halocline caused by the river run-off and beneath it the visibility suddenly opened up marvelously! Our concerns for the visibility had proven to be unfounded and we would be blessed all week with visibility ranging from good to superb. We descended the slope slowly moving from boulder to boulder. Each one seemed to have its own personality  some being completely covered with Featherstars or orange Zoanthids, others hosted clusters of Chimney sponges, while still others had congregations of Sea Cucumbers, Sunflower Stars or other invertebrates. I found the Chimney sponges in particular to be excellent photo subjects, as they frequently had resident Warbonnets, crabs, shrimps or Rockfish peering out at the world from within the spout of the chimney. Emerging from the water at the end of the dive with a collection of new images and the reassurance of having tested out our equipment, the team eagerly looked forward to our future dives. Photo: A Giant Dendronotid Nudibranch, Dendronutus iris, glides along a rocky ledge in search of its next meal. These huge nudibranches have been known to reach 12 inches in length. Photo by Bob Bailey. Our second dive that day was at the showcase site  located at the narrows of Mozino Point. A vast current-swept area hundreds of feet in length and extending below 200 feet in depth, divers can easily hit this site on several days in a row and never see the same spot twice. The first aspect of the site that immediately draws your attention as you descend down through the jumble of rocks on a gradual slope is that virtually everything is completely covered with a literal blanket of brilliant red and pink Strawberry anemones, making Mozino Point one of the most amazingly colorful dives to be found anywhere. Starting around 70 FSW the first of the Cloud sponges make their dramatic appearance and completely rivet the divers attention with their unusual cloud-like shapes. Ranging from the purest of white to pale yellow, the Cloud Sponges of Mozino Point are startlingly highlighted by the surrounding carpet of pink Strawberry Anemones  producing dramatic subjects for underwater photographers looking for color and contrast. These sponges are constructed of silica - commonly being referred to as glass sponges - and are extraordinarily delicate. The size and bizarre appearance of these sponges increases with depth and by the time that you pass 100 FSW many of them are of almost monstrous proportions. One of our team members, Bob Bailey, described the largest ones as almost requiring license plates! A diver can often discover dozens of them within view simply by casting about the beams of your lights. 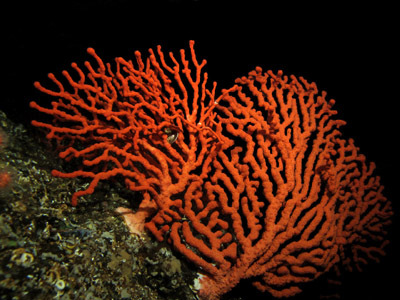 Past 100 FSW divers will also begin to find smaller examples of bright orange and pink deep-water Gorgonian corals, also steadily increasing in size with depth in addition to assuming bizarre fan-like shapes. As the wall at Mozino Point plunges downward, these corals become increasingly prolific until they almost appear to form an incredible orange forest. Dwelling in complete darkness, each coral colony establishes its own feeding schedule, and it is common to find one colony with its polyps extended and actively gathering food from the passing current while the colony next to it has all of its polyps retracted and appears to be completely dormant. In such cases the two colonies will almost appear to be completely separate species. Few divers in the world have experienced such a delightful combination of species such as this, and photographing the Cloud sponges and Gorgonian corals at Mozino Point is an absolutely stunning experience. Photo: ADM Publisher Curt Bowen approaches a Cloud Sponge at Mozino Point. Known for their often bizarre, cloud-like appearance, these sponges are incredibly delicate - much like fine china. Photo by John Rawlings. 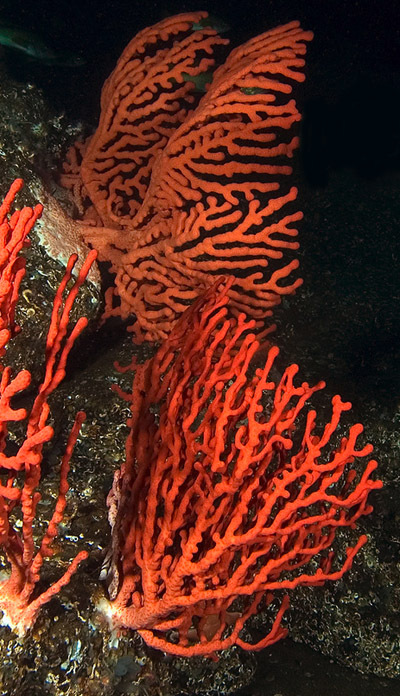 Photo: Deep-water Gorgonian corals bending with the current in utter darkness. Unlike tropical species, these corals do not require sunlight to survive, instead feeding on nutrients brought by the currents. Photo by John Rawlings. Photo: Surrounded by colorful anemones, another unusually-shaped and beautiful species of sponge also common at Mozino Point in large numbers is the White Reticulated Sponge - Iophon chelifer. Photo by John Rawlings. 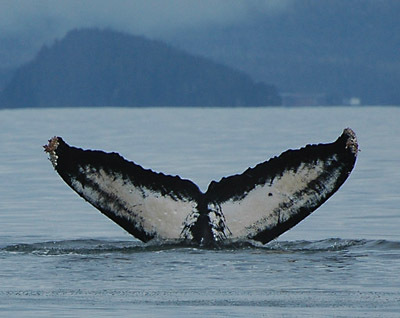 Photo: Humpback Whales can frequently be sighted in Nootka Sound during their migrations, both as individuals or in pods. Photo by John Rawlings. 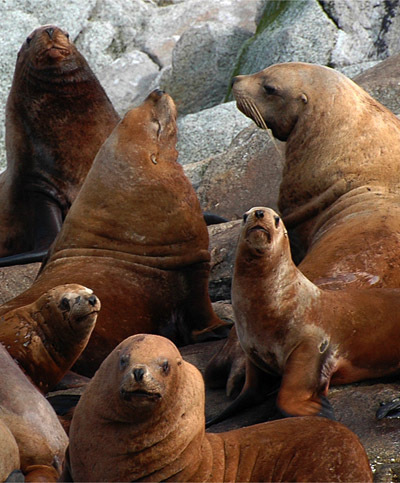 Photo: Steller Sealions, the largest of the eared seals, are common in Nootka Sound. The largest bulls can reach up to 2,500 pounds in weight. Photo by John Rawlings. Photo: The ADM Team saw numerous Black Bears during our adventure - all seemed intent on stuffing themselves in anticipation of Winter. Being omniverous, succulent grass was often part of the menu! Photo by Curt Bowen. there was at least six and probably seven different species in that cloud. I was still cursing my bad luck with my camera when I hit the surface with absolutely no useable images from a marvelous dive. Between dives we again encountered a small pod of Humpback Whales as well as a group of rocks covered with both Harbor and Fur seals, making for an exciting surface interval. I spent the next dive topside - tinkering with my camera system while the others dived another site that had not ever been dived before  Garden Point, on the south side of Esperanza Inlet, about six miles south of the Gardens. They emerged at the end of the dive to tell me that there had been so many fish on the wall that it had been like diving in an aquarium! My disappointment was tempered, however, as we were able to watch the antics of several Black Bears on shore, including a mother and cub, as we headed back in to Tahsis. 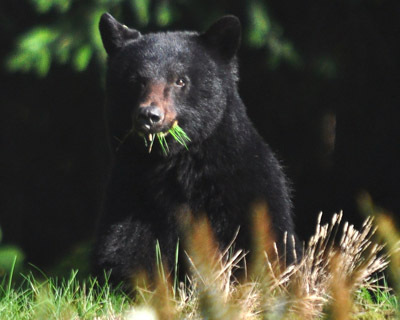 Photo: The team also often observed Black Bears foraging amongst the rocks and logs on the beaches - marine invertebrates such as mussels and small crabs being a significant part of their diet. Photo by Curt Bowen. Photo: Sea Otters were frequently sighted. During the Spring and Summer large "rafts" of dozens of otters can be seen. During our stay we sighted individual males off on their own. Photo by Curt Bowen. whatever had mysteriously caused the dome port condensation the day before had not reared its ugly head again. Photo: Commercial Tuna boats seek refuge from stormy weather out at sea by tying up to the Government dock at Tahsis. Their temporary stay allowed the team to dine on fresh Albacore steaks - an unexpected treat! Photo by Curt Bowen. Photo: Each individual colony of Gorgonian Corals is absolutely unique and will form strange fan-like shapes based on the currents. Photo by Bob Bailey. Photo: ADM Publisher Curt Bowen clinging to a rock during a decompression stop. Currents are what feeds the huge outpouring of life at Mozino Point, but those same currents can make decompression rather "problematic" at times. Photo by John Rawlings. 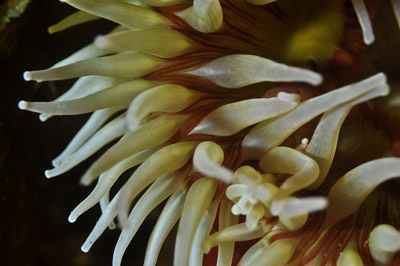 Photo: A close-up shot of a "Fish-Eating" anemone, Urticina piscivora. Photo by Curt Bowen. 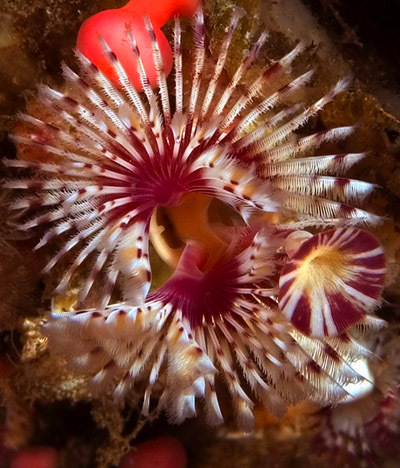 Photo: The sloping walls of Mozino Point and elsewhere in Nootka Sound are blanketed with thousands of tiny Strawberry Anemones, enabling photographers to take astonishingly colorful images. Photo by John Rawlings. 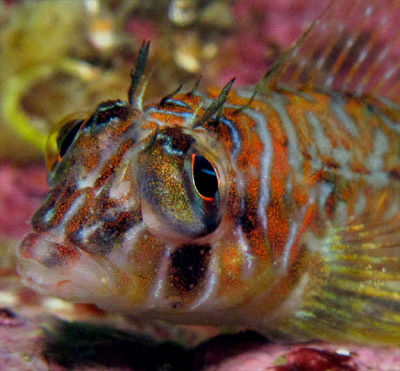 Photo: A tiny and strikingly colorful Longfin Sculpin peers back at the camera lens. This small, skittish fish is a common sight on rocky walls, but can be difficult to photograph. Photo by Bob Bailey. 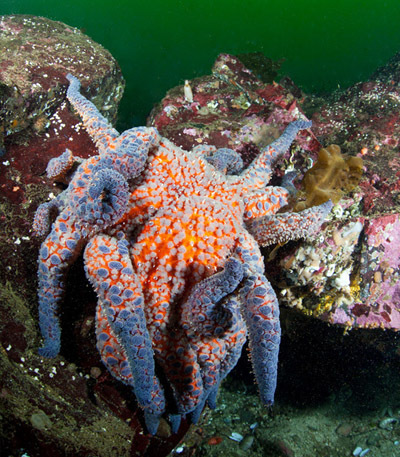 Photo: This dramatically colored Sunflower Seastar almost seems to have become entangled with itself! 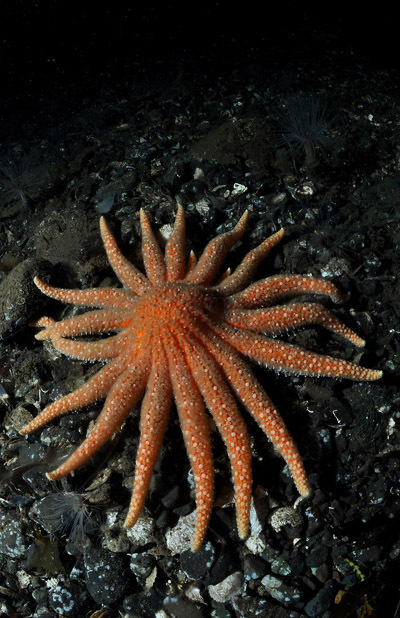 Possessing up to 26 arms and the fastest of all seastars, this species is a voracious predator. Photo by Bruce Yates. The second dive of the day was at a location known as Shark Point, because at one point it was at the site of an old fish processing factory and Blue sharks in their hundreds had been attracted to the factorys effluent. Absolutely no physical trace of the factory now remains, and the Blue sharks have also long since disappeared, but the name of the point remains. It is now known for its colossal invertebrate population and the marvelous macro photography opportunities to be found there. Members of the team would return to this site again later in the week to take further advantage of those opportunities. well, let me relate that its an incredibly marvelous feeling to be sitting down in a traditional small-town Pub, tired from a solid days worth of diving, drinking and swapping tales of derring-do with good friends, while eating a freshly prepared Tuna steak the size of a human foot! Id have to search deep into my memory to find a better night! believe it or not, one involving snorkels! 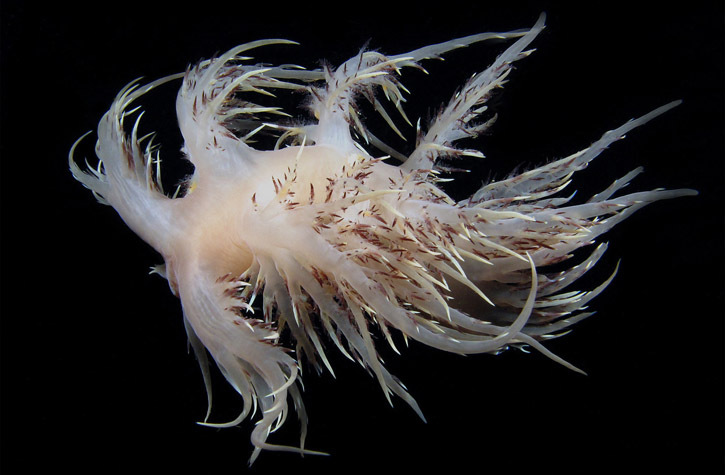 Photo: A beautiful photo of a Giant Dendronotid Nudibranch swimming in the water column, thrashing back and forth almost like a dancer covered with billowy feathers. Photo by Bob Bailey. 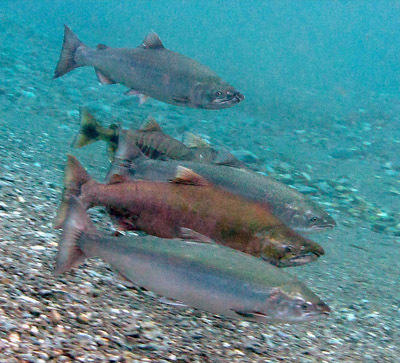 After passing through the village, the Tahsis River empties directly into the inlet, and Salmon in their hundreds were moving upstream to reach their birthplace to spawn and launch a new generation. Our team drove to a location just outside the village and walked down through the woods to the banks of the river, where we could easily see dozens of Salmon clustered in large pools between stretches of shallow rapids. Borrowing snorkels from Scott (none of the Tec divers had even given a passing thought to bringing one!) one by one each of us slipped into the shallow water and let the current sweep us down like large sticks of wood through the rocks to where the Salmon clustered in the pools. Popping past the last few shallow rocks we would rocket out into the crystal-clear pool, sending Salmon darting off in a panic in all directions like silver rockets! We would then clamber out of the river and make our way back upstream to the entry point to make the run again. This was something that none of us had ever done before, and it wasnt long before each of us was experiencing and feeling the results of our complete ignorance! Use strobes or available light? Shoot in auto or manual? Shutter speed? What level of wide-angle lens to use? How much weight to wear, if any? Shoot still photography or video? Suffice it to say that literally hundreds of photos were taken but very, very few ended up worthy of being kept! At one point I was walking back upstream for another run and Scott quietly pointed out that there was a big old Black Bear boar walking along the bank of the river in the opposite direction directly at me! I believe that the terms Scott used were, hes big enough to run on diesel! Both the bear and I decided that discretion was the better part of valor  keeping his eye on me, he crossed the river to the other side while I kept my eye on him and entered the water to float away downstream! Definitely NOT your typical dive, but exciting in all aspects nonetheless! Photo: Spawning Salmon in the Tahsis River shoot past the camera lens as they try to avoid the ADM team. Photo by Bob Bailey. Photo: On our "dive" with the Salmon the team had to "re-learn" old habits and get used to snorkels all over again - not a simple matter for tec and rebreather divers! Photo by Curt Bowen. Photo: A Black Bear sow and cub crossing the Tahsis River, their excellent noses leading them to a variety of food sources - such as Salmon carcasses. Photo by Curt Bowen. Photo: Part of the small but friendly Esperanza community, with bright and colorful Fall colors gracing the trees. Photo by Curt Bowen. So far we had been blessed with absolutely marvelous weather, the sunshine making our surface intervals things of both joy and warmth! We had expected a couple of rainy days based on both the previous week and the forecast, but our team somehow managed to luck out. On our last day while boarding the boat we were completely surrounded by dense fog, but in the Pacific Northwest that is usually a sure sign of sunshine to come, and so it proved to be. For our final day of diving we decided to hit the repeat button in terms of dive sites  some of us wanting more macro opportunities while others wanted to return deep to the corals. The solutions to the dilemma were Mozino Point for the first dive of the day and a return to Boulder Alley for the second dive. Each of us clambered back up the ladder into the dive boat with dozens of new images to sort through later and oooh and aaah over  a most fitting ending to a marvelous week of diving! The rain began to drizzle down as we headed back in. Clearly, the weather gods had the decency to wait until we were finished! 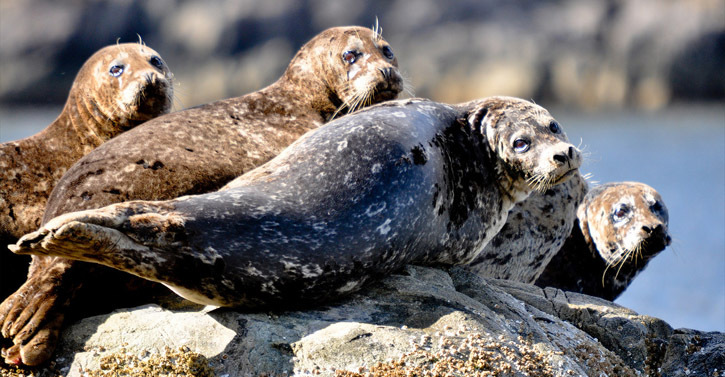 Photo: Harbor Seals are also quite common in the waters of the Sound, and can frequently be found sunning themselves on the log booms in town or in large groups on rocks. Photo by Curt Bowen. Both the author and ADM Publisher Curt Bowen would like to give special thanks to Scott and Jude Schooner of Tahtsa Dive Charters for their support and friendship, along with Boswell, their happy dog who was always ready to happily lick a face! Special thanks also go to the villagers of Tahsis, who warmly welcomed a bunch of strangers into their little bit of Heaven. Photo: An actively hunting Sunflower Seastar gliding across the bottom in search of its prey. Photo by Curt Bowen. Below: A small "Dozer Boat" used for pushing logs. This particular one was in the village harbor and is used to maintain the log booms and piers. Photo by Curt Bowen.